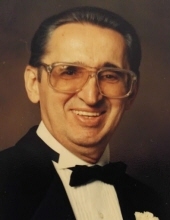 Celebrating the life of Michael W. Koscielny, Sr.
Obituary for Michael W. Koscielny, Sr.
Michael W. Koscielny, Sr. was born on September 29, 1925 in Chicago, Illinois to Albert and Helen (nee Danylyszyn) Koscielny. He passed away Saturday, October 27, 2018 in Buffalo Grove. Mike was a member of St. Mary's Church Vernon Hills. Passionate model builder, especially ships. His love of architecture, especially Frank Lloyd Wright was reflected throughout his career as a Draftsman. Mike is survived by his children, Michael W. (Deborah) Koscielny, Jr., Jean Keefe, and Pamela Koscielny; grandchildren, Michael "Trey" W (Michele) Koscielny, III, Rachael E. (Andrew) Sutter, Daniel W. Keefe, and Kathleen E. Keefe; Great-Granddaughter, Daenerys A. Koscielny. He was preceded in death by his wife Barbara (nee Crockett); sisters, Stephanie Towers, and Jennifer Koscielny. Visitation from 6:00 pm until 8:00 pm, Monday, October 29, 2018 at Glueckert Funeral Home Ltd., 1520 North Arlington Heights Road (4 blocks south of Palatine Road), Arlington Heights, Illinois. Funeral service Tuesday, October 30, 2018, at 10:00 am at the funeral home. Interment at Queen of Heaven Cemetery, Hillside, Illinois. In lieu of flowers memorials may be given to Prostate Cancer Foundation, 1250 Fourth St., Santa Monica, CA 90401, or online at <https://cure.pcf.org/site/Donation2?df_id=1561&mfc_pref=T&1561.donation=form1> Funeral Information and condolences can be given at www.GlueckertFuneralHome.com or (847) 253-0168. "Email Address" would like to share the life celebration of Michael W. Koscielny, Sr.. Click on the "link" to go to share a favorite memory or leave a condolence message for the family.